Introduction-When you delete files from Desktop PC or Laptop then it is not permanently deleted from the hard disk drive and files remain saved in disk drive until overwritten, and it might be possible to recover deleted data by using any data recovery software or undelete utility.For permanently data deletion from the computer system and removable media Data Doctor’s offers Data wiping Utility which completely wipes entire disk data, internet history, cookies, chat conversation, e-mails (even deleted) and other existing or non existing data for the Desktop/Laptop privacy. Data erasure tool is an advanced security tool for windows which allows you to permanently remove sensitive data, unused disk space and temporary files from your computer system hard disk drive for better system performance. Easy to use data eraser tool facilitates with systematic help menu for user’s assist and improves the computer speed. √ Data Wiping Utility permanently wipes disk data by Destructive and Non-Destructive mode. √ Destructive Mode:- In destructive mode, wiping software completely wipes the entire disk partition (saved or unsaved data) or selected disk area sector range regardless data saved in that sector range. After using destructive wiping mode hard disk will be reformatted or works as a fresh drive. √ Non destructive Mode:- In Non destructive mode, disk eraser tool facilitates with tree structure format for data wiping and user can select data (such as unused disk space, internet history, cookies, e-mails, administration files, Microsoft office documents and much more files) for the better system performance. √ Please Remember:- If you choose Destructive Mode for data wiping then Be Careful! √ In destructive mode software completely wipes the entire disk data and computer hard disk will work as a formatted disk drive. 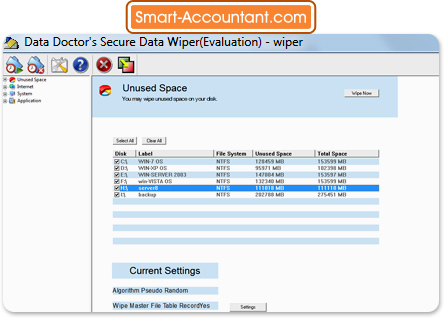 Data eraser tool completely wipes data from the entire hard disk and removable media. Permanently clean unused disk space for better system performance. Disk wiping utility permanently erases data by Destructive or Non-Destructive mode. Software utility wipes internet history, cookies, temporary files, office document files for computer privacy. Completely remove deleted e-mails, chat conversation and other online/offline internet activities. Disk cleaner software cleans entire hard disk for OS reinstallation in Destructive Wiping mode. Facilitate to switch from destructive mode to non destructive mode or vice versa. Once data removed, you can not recover deleted data by any data recovery utility. Easy to use utility facilitates with systematic help menu for user’s assist. Improve system speed by removing unused disk space and temporary files.